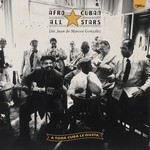 'A Toda Cuba le Gusta', the classic debut album by the Afro-Cuban All Stars. The first in a trilogy of extraordinary albums recorded by World Circuit in a single two-week session at Havana's EGREM studios, 1996. The other albums, which share many of the same personnel, were 'Buena Vista Social Club' and 'Introducing Rubén González'. Remastered by Bernie Grundman from the original analogue tapes and now available for the first time on double 180gm heavyweight vinyl, housed in a gatefold sleeve and presented alongside a 32 page booklet as part of World Circuit's classic album series. Plays at 45rpm.